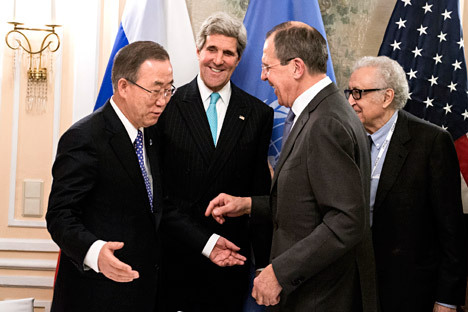 No obvious progress has been made at the Syrian talks, but the situation is not hopeless. The conflict in Syria and the dramatic situation in Ukraine were at the top of agenda of last weekend’s 50th Munich Security Conference. As soon as Russian Foreign Minister Sergei Lavrov arrived in the German city late last Friday, he engaged in talks on the situation in Syria. He first held a one-on-one meeting with U.S. State Secretary John Kerry; then, the two were joined by UN Secretary-General Ban Ki-moon and special UN and Arab League representative Lakhdar Brahimi. Brahimi arrived in Munich from Geneva, where the first round of talks between the Syrian government and the opposition ended on Jan. 31. The Algerian diplomat reported that the talks would resume on Feb. 10, and expressed his hope that the second round would be more productive. In fact, some progress has been achieved on the issue of providing humanitarian assistance to the thousands of Palestinians living at the Yarmouk refugee camp in Damascus. The camp was set up well before the fighting broke out in Syria. Brahimi also said, however, that little has been done to bring relief to the people of Homs or facilitate an exchange of prisoners between the government and the rebels. "Differences between the two sides are very significant, and there is no point pretending otherwise," Brahimi said. The most contentious issue is the formation of a transitional governing body in Syria. Representatives of the National Coalition for the Syrian Revolutionary and Opposition Forces hoped to begin discussing the composition and the remit of that body, but the Syrian government’s delegation insisted that fighting terrorism should be the top priority. To prevent the talks from breaking down, Ban Ki-moon urged the two co-sponsors of the Geneva II conference, Russia and the United States, to become more involved in the proceedings. Kerry responded by saying that he is working with Lavrov in order to engage the government of Bashar Assad in the peaceful settlement process. He said there were good reasons why Assad should be more interested in urgently taking part in the talks, but did not specify what those reasons were. For his part, Lavrov argued that Moscow cannot achieve results on its own by pressuring Assad and that those who support the Syrian opposition should also use their clout with the rebels. Lavrov reiterated that sentiment when he addressed the Munich Conference. “Acting alone, Russia cannot achieve anything," Lavrov said. “It is important that the external players should desist from trying to portray their ‘sponsored’ Syrian representatives as the only legitimate representatives of the Syrian people. They should put pressure on the Syrian factions to remain in Geneva and press ahead with the talks instead of slamming the door." Lavrov added that the dialogue in Geneva must be made genuinely representative as soon as possible. “Everyone who has influence on the opposition must make sure that all sections of Syrian society are represented at the negotiating table. That is a requirement outlined in UN Security Council Resolution 2118, which approves the June 30, 2012 Geneva Communiqué and supports the conference that aims to implement that communiqué,” Lavrov said. Lavrov once again drew the Euro-Atlantic political elite’s attention to the fact that the prolonged conflict has turned Syria into a bastion of extremists and terrorists from all over the world. Nobody knows how these people will apply the dangerous skills they have gained in Syria once they have returned home. “The outrages they are committing against Christians and other minorities in Middle Eastern countries give plenty of reasons to be very worried," said Lavrov. Meanwhile, the head of the Syrian National Coalition, Ahmad al-Jarba, is expected in Moscow on Feb. 3. He is scheduled to meet Lavrov the following day to discuss the priorities for the second round of the Geneva II talks.